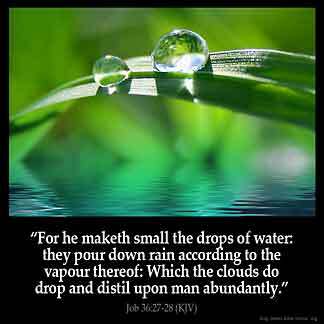 JOB 36:27 KJV "For he maketh small the drops of water: they pour down rain according to the vapour thereof:"
24Remember that thou magnify his work, which men behold. 25Every man may see it; man may behold it afar off. 26Behold, God is great, and we know him not, neither can the number of his years be searched out. 27For he maketh small the drops of water: they pour down rain according to the vapour thereof: 28Which the clouds do drop and distil upon man abundantly. 29Also can any understand the spreadings of the clouds, or the noise of his tabernacle? 30Behold, he spreadeth his light upon it, and covereth the bottom of the sea. For he maketh small the drops of water: they pour down rain according to the vapor of it. 36:27 For - Having affirmed that God's works are incomprehensibly great and glorious, he now proves it from the most common works of nature and providence. And hence he leaves it to Job to consider how much more deep and inconceivable the secret counsels of God must be. Water - He orders matters so wisely, that the waters which are in the clouds, do not fall down at once in spouts, which would be pernicious to the earth and to mankind; but by degrees, and in drops. According - According to the proportion of vapours which the heat of the sun hath drawn up by the earth or sea. So it notes that great work of God by which the rain is first made of vapours, and afterwards resolved into vapours, or into the matter of succeeding vapours, by a constant rotation. Had overlooked that one: Great Insight !!! !